Later this morning there will be a rare opportunity to see the largest airplane in the world which will touch down at Shannon airport, before departing tomorrow morning. The Antonov An-225 Mriya designed by the Soviet Union’s Antonov Design Bureau in the 1980s. 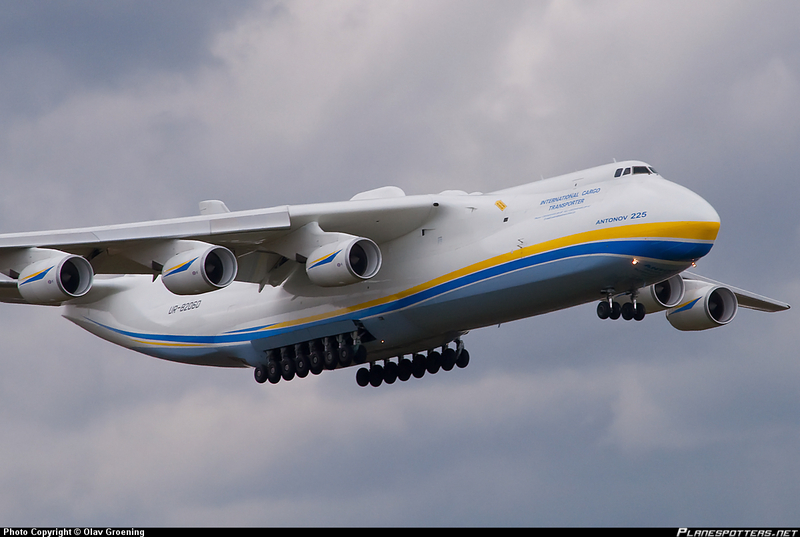 The An-225’s name, Mriya (Мрiя) means “Dream” (Inspiration) in Ukrainian. It is the largest airplane in the world. It was originally built to transport the Energia rocket’s boosters and, the Buran space shuttle for the Soviet space program. The An-225 first flew on 21 December 1988 with a 74 minute flight from Kiev. It was on static display at the Paris Air Show in 1989 and it flew during the public days at the Farnborough air show in 1990. The An-225 has since become the workhorse of the Antonov Airlines fleet, transporting objects once thought impossible to move by air, such as locomotives and 150-ton generators. It has become an asset to international relief organizations for its ability to quickly transport huge quantities of emergency supplies during disaster relief operations. On 11 August 2009, the heaviest single cargo item ever sent via air freight was loaded onto the Antonov 225. At 16.23 metres (53.2 ft) long and 4.27 metres (14.0 ft) wide, the consignment–a generator for a gas power plant in Armenia and its loading frame–weighed in at a record 189 tonnes (420,000 lb). In June 2010, the An-225 carried the world’s longest piece of air cargo, when it flew two new 42-meter test wind turbine blades from Tianjin, China to Denmark. It has also been contracted by the Canadian and U.S. governments to transport military supplies to the Middle East in support of Coalition forces. ‹ Ardmore Studios boss, questions Northern Ireland state-aid for Dracula. Had the task of finding an Antonov for the film The Jackal with Russian markings. Ended up using The Illusion 76 out if Riyadh which I found in RAF Mersden in Kent. Amazing planes.